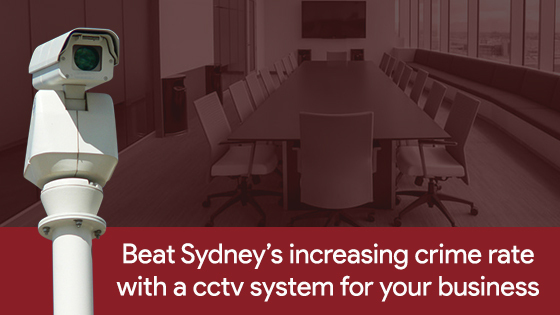 Beat Sydney’s increasing crime rate with a CCTV system for your business. When planning for 2017’s financial budget, business owners should consider CCTV systems for their Sydney business. Recent reports have indicated a reduction in crime for the most part, however businesses have seen a 6.3% increase in crime. It is best to always be one step ahead of criminals so installing CCTV and other security measures, as a deterrent, is a great way to avoid any future trouble. The BOSCAR Crime Report from June 2016 indicated that most areas are down on the usual crimes like breaking and entering and car theft, however there is an unusual growing trend in theft from businesses. This trend bucks the usual decrease in crime and is surprisingly on the rise in traditionally higher socio-economic areas. It is easy to see that where the businesses are, the crime will follow. In Sydney alone, retail theft was up 22.1% in the Eastern suburbs, 20% in the Northern Beaches area and 18.6% in Sutherland. Thieves are targeting businesses more and more as they learn how to use new technology to their advantage. Retail theft is something that is hard to spot without using CCTV cameras to catch criminals in the act. Theft from retailers has been increasing rapidly over the last year. Supermarkets receive 22% of all reported retail theft, followed by department stores at 13% and liquor shops of 9%. That leaves 48% of reported theft from small businesses and local small operators. If that is a statistic that is only increasing, then any additional security measure to protect your stock and staff is beneficial. On top of retail theft, the BOSCAR Report indicated an increase of 28.2% in malicious damage to property. As the saying goes, image is everything, so any vandalism to business signage or slogans sprayed on shop windows can hurt business. Keeping an eye on your businesses perimeter can deter any malicious damage and keep vandals away. Awareness of the recent increase in crime against businesses is not something to be alarmed about. There is always a degree of theft or vandalism. However, with a CCTV system in Sydney, you can avoid being another statistic in the annual crime reports. If you want to talk to a professional about security measures for your business, please give one of our experienced staff a call on 1300 13 40 33.